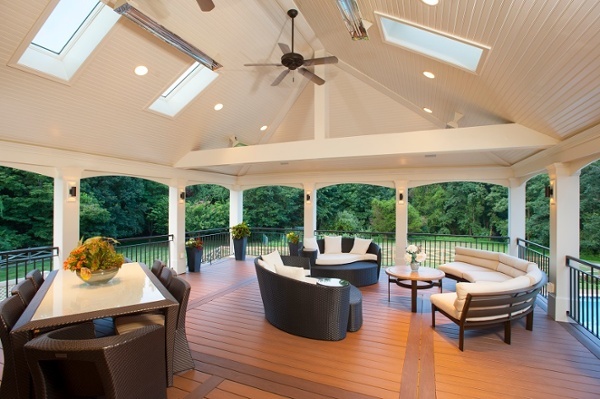 A pavilion-style porch and hot tub deck were constructed for this Vienna, Virginia home using low-maintanence materials. 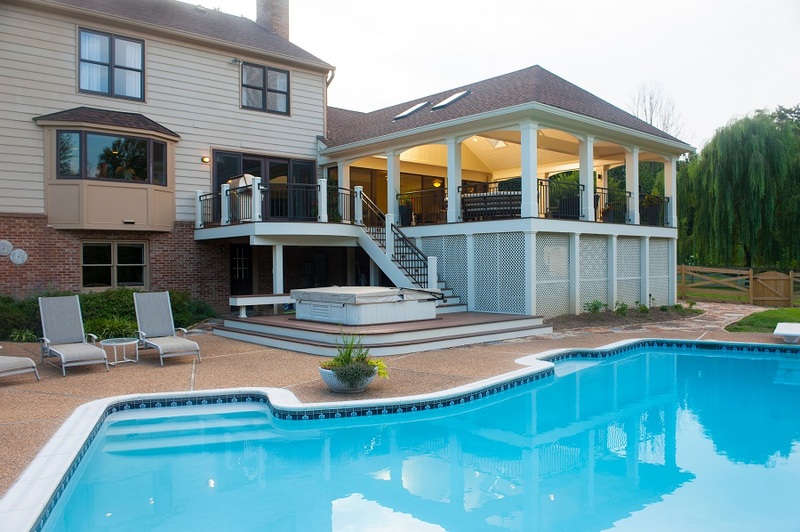 They are both Design Builders, Inc. original designs and were conceived to complement the house and existing pool area. The first step outside takes the homeowners onto AZEK PVC decking, regardless of whether they exit through the porch or deck entrance. This material was used because it can withstand harsh hot tub and pool chemicals as well as the elemenths for many years without additional attention. It is contrasted with black wrought iron handrails and white pillars fitted with outdoor sconce lights. 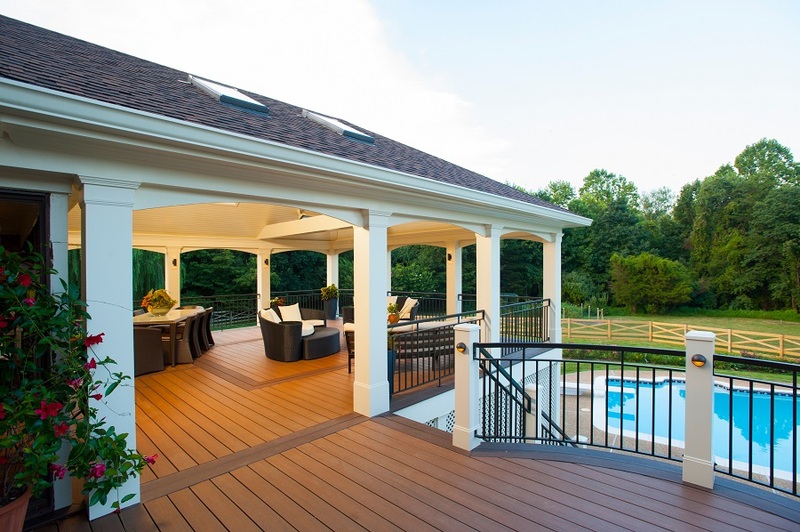 The downstairs deck where the hot tub is located is accessible by way of an AZEK curving staircase from the first floor deck, which sits adjacent to the pavilion-style porch. 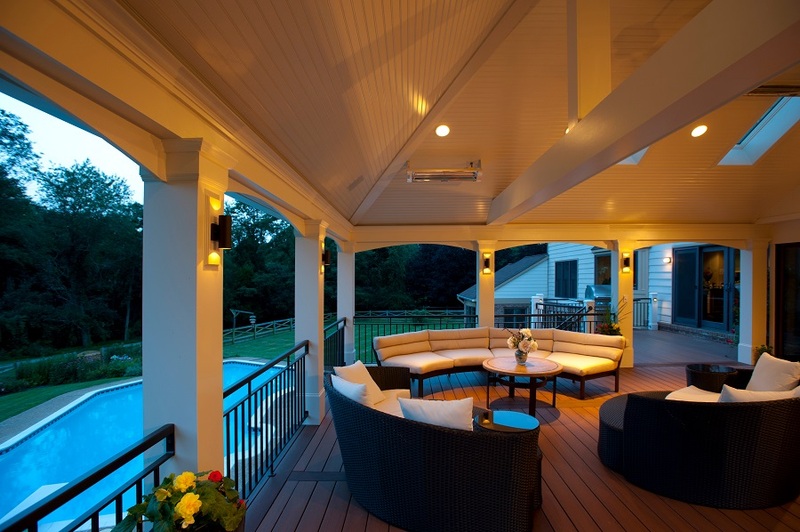 The porch is wired with electricity, which allowed it to be outfitted with outdoor ceiling fans, low-voltage lights and sconce lighting, and infrared heaters. It also boasts multiple skylights, an artistic ceiling, 10" decorative columns, and double boarder AZEK decking with inlay. The lighting and heating attributes of this deck make it usable day or night throughout the year.